Resentment among Pashtuns at the state’s despicable treatment of them has been brewing for almost a decade-and-a-half and finally spilled over when the police shot dead Naqeebullah Mehsud, an aspiring model, in an 'encounter'. Some have called it the ‘spring of Pashtun awakening’, some ‘an uprising’ and yet others have smeared it as a façade engineered by foreign intelligence agencies, but to me, the Pashtun protests over the past two months are the cries of a wounded soul, a shriek of the insulted and humiliated, the wailing of the bereaved that came out as an appeal for redress but could turn into a call for an upheaval. Bhagat Singh had said that a rebellion is not a revolution, but it may ultimately lead to that end. The protests by the tribal Pashtuns in Pakistan are certainly neither rebellious nor seeking anything revolutionary, but if their demand to be granted a right to life with safety and dignity according to the constitution of Pakistan is not heeded, it could portend the makings of something more radical. Anger among the Pashtuns living in Pakistan at the state’s despicable treatment of them had been brewing for almost a decade-and-a-half. It finally spilled on to the streets when Naqibullah Mehsud, a young Pashtun man from South Waziristan, was killed extrajudicially on January 13 by a police officer named Rao Anwar in the provincial metropolis Karachi. Anwar, a senior superintendent of police (SSP), later tried to smear Naqeeb as a terrorist, but it was clear that he had slaughtered in cold blood – in a staged police encounter – an innocent man. I pointed out immediately that Naqeeb appeared to be an aspiring model rather than a terrorist thug. His body was retrieved by three young men from the southern Pashtun town of Zhob on January 17 and within hours social media was ablaze with calls for justice and the arrest of SSP Anwar. Karachi is home to the largest urban Pashtun population, some of whom took to the streets to protest the violent killing of a benign young man. An official inquiry exonerated the deceased but the culprit policeman remains at large. For the first time in Pakistan’s 70-year history, the Pashtuns from the tribal regions, supported by others from the “settled areas”, converged on the federal capital Islamabad to protest and seek justice for Naqeeb. This came to be known as the Pashtun Long March (PLM) and drew upwards of five to six thousand people who chanted daily, for a week, in Islamabad: “Da Sanga Azadi Da … What kind of freedom is this, in which Pashtuns are being murdered, being ruined”. It truly was unprecedented. The last time I recall when Pashtuns gathered en masse anywhere near Islamabad in a demonstration was 45 years ago in March 1973, when the Pashtun nationalist leader Wali Khan, leading the National Awami Party (NAP) at the time, addressed a united opposition rally at Liaquat Bagh, Rawalpindi next door to Islamabad, which was fired upon by thugs acting at the behest of the then prime minister Zulfikar Ali Bhutto, killing 11 people. There are, however, key differences between the NAP and its eventual successor, the Awami National Party (ANP), its estranged sibling outfit Pakhtunkhwa Milli Awami Party (PMAP), which has led the nationalist campaign in the Pashtun part of Pakistan’s Balochistan province, and what has now come to be known as the Pashtun Tahafuz Movement (PTM or Pashtun Defence League), not limited to the fact that the PTM is a grassroots awakening that has no anchor in ideology or a political manifesto. More importantly, Pashtun nationalist politics in Pakistan has always been led by Pashtuns like the great Abdul Ghaffar Khan aka Bacha Khan or the Frontier Gandhi and his contemporary Abdul Samad Khan Achakzai, both of whom hailed from what were classified and called as ‘settled areas’ by the British colonialists and then its successor Pakistani state. The Pashtun identity politics of Bacha Khan and Samad Khan Achakzai dovetailed into the Indian freedom struggle and were carried out predominantly from the urban and suburban areas of Peshawar and Quetta. On the other hand, an organised political process in what in Pakistan is called the Federally Administered Tribal Areas (FATA), was banned by the British and then the Pakistani state. As far as one can tell, there has not been a tribal Pashtun movement bucking or protesting the central authority since the one led by Faqir of Ipi in 1936 against the British. Additionally, the latter-day ANP and PMAP have focused on parliamentary politics with attention on Islamabad and have tried to avoid overt and official condemnation of the Pakistani army’s excesses lest they are labeled again as seditionists as they were for a good 40 years of Pakistan’s existence. Without either a past political baggage or a future stake in Islamabad the PTM had no such constraints; it was free to call a spade, a spade. The PLM was an inevitable response to the Pakistani state’s neglect and outright atrocities in the FATA, which have been going on for decades; the Naqeeb murder was a mere tipping point – the proverbial last, straw which broke the camel’s back. After the British exited from the South Asia, Pakistan effectively preserved all of their policies in the FATA. The British empire in India saw Afghanistan as a buffer against the Czarist Russia and then the Soviet Union, and the FATA as a buffer against the buffer. The British maintained a policy of a “double frontier”, wherein the Durand Line was the demarcation between Afghanistan and the FATA, while an additional administrative demarcation separated the FATA from the British-Indian North West Frontier Province (NWFP), which is now called Khyber-Pakhtunkhwa (KP) province in Pakistan. Pakistan maintained the exact same policies post-1947, with the country’s founder Mohammed Ali Jinnah making a compact with the tribal Pashtuns of FATA that if they remain loyal to Pakistan, they’d keep their so-called autonomous status. That quasi-autonomy was a farce before, during and since Jinnah’s reign. The British ruled the FATA through the heinous Frontier Crimes Regulation (FCR), and the Pakistani state has continued to do so since the independence. The FCR is a draconian set of laws, first implemented in 1901, which is not only ultra vires of the fundamental human rights but also flies in the face of Pakistan’s 1973 constitution. It has no room for due process of the law and the modern criminal justice system and courts. Additionally, the FCR affords the state the power to inflict collective punishment on the Pashtun tribes, clans or families for the offences committed by individuals. Afraid of the Pashtun nationalism and irredentism brewing under the shadow of Afghanistan, Pakistan opted to keep both the British double-frontier policy and the FCR to rule the FATA. Residents of the seven tribal agencies – three of which were formed after the Partition – were at the whim of the Pakistan-appointed political agents and the army, which, despite claims to the contrary, maintained fortresses and cantonments in the FATA. In a standoff with Afghanistan over its revanchist claims on the Pashtun territories that became part of Pakistan, the latter chose to use the FATA as a launching pad for the Islamist insurgency in Afghanistan. As early as 1973-74, Pakistan facilitated an Afghan jihadist Jalaluddin Haqqani to establish his jihadist network in the North Waziristan Agency (NWA), which was the harbinger of what became known as the terrorist outfit Haqqani Network (HQN). The HQN launched insurgent attacks first against the government of President Sardar Daoud Khan in Afghanistan and has continued its assaults against the incumbents in Kabul except the Taliban, whom it has been a part of. Similarly, other jihadists were harboured in FATA by Pakistan, to fight against the Soviet Union and then the US in Afghanistan. The Kurram, SWA and NWA were the principal points d’appui to launch the jihadists into Afghanistan from the mid-1970s to date. Jalaluddin Haqqani, for example, set up his madrassa (religious seminary) and training facility near the district and military headquarters in Miram Shah, NWA in 1973-74 that remained functional till at least 2014. When the US, in retaliation of the 9/11 attacks by the Taliban-supported al Qaeda, attacked Afghanistan, the Taliban and al Qaeda fled to the FATA with a tacit support from Pakistani army. These jihadists, including Arabs, Uzbeks, Chechens – moved through the tortuous Tirah valley across from the Tora Bora mountains in Afghanistan and made their way to the NWA and the SWA. This jihadist resettlement peaked from 2003-04 and, quite ominously, they also recruited and organised locally in the Pashtun tribal areas. Many elements of this jihadist conglomerate operating out of the SWA and the SWA, saw the policy of the military dictator, General Pervez Musharraf to side with the US, as exactly what it was – duplicitous and treacherous. When the US told Musharraf the option he had was to be “with us or against us”, he opted to play a double game wherein he and the Pakistan army helped the US carry out certain actions against the al Qaeda but preserved and jealously guarded the Afghan Taliban and its HQN affiliate leadership inside Pakistan. The Afghan Taliban and the HQN drew support from and recruited among the radicalised Pakistanis, including from the FATA Pashtuns. Some sections of this Af-Pak Taliban combine deeply resented even the Musharraf regime’s outward policy of supporting the US. When Musharraf ordered, under duress from the Chinese, a military action against the Lal Masjid – a jihadist hub inside Islamabad – the Pakistani section of the Taliban rebelled against him and the state, forming what became known as the Tehrik-e-Taliban Pakistan (TTP), an outfit that pledged allegiance to the Afghan Taliban’s emir Mullah Omar and vowed to topple the Pakistani state. The TTP unleashed a reign of terror against the Pakistani people, state and the army, killing tens of thousands in hundreds of terrorist attacks. The state first dragged its feet but under immense public pressure to respond, the army eventually retaliated through at least ten military operations – all in the FATA save two in Swat valley. The disconcerting part, however, has been that the army targeted exclusively the so-called bad Taliban i.e. the ones who attacked the Pakistani military and the state. These operations effectively spared “good Taliban” vis the Afghan jihadists and the ones like the Jamat-ud-Dawa (JuD) who targeted Afghanistan and India, respectively. The problem with this scheme was that the good Taliban harboured the bad ones and even jointly ran suicide bomber-training schools. The Pakistani army and state first attempted to negotiated with the “good Taliban” and even inked deals with them, but when the latter did not relent in their barbaric attacks, the former responded by force. The problem with these military operations against the TTP was several folds: they were formally announced months in advance affording the militants a gingerly escape; focused exclusively on the “bad Taliban; targeted the civilian population of FATA rather indiscriminately and punitively; forced the bystanders and innocents to flee their homes and become the so-called internally displaced persons (IDPs); failed to concede or acknowledge that the jihadist disaster in FATA was a blowback from the Pakistan army’s Afghan policy. The Pakistan army launched its penultimate major operation in FATA by the name Zarb-e-Azb, in summer 2014. The operation was ostensibly conceived to purge the FATA, especially the NWA, from the jihadists of all shades. The reality, however, was that before the actual operation was carried out, a curfew used to be imposed in the theatre of action, and the Taliban and jihadists friendly to the Pakistani army, specifically the HQN, were bussed out to other safe havens. The so-called bad Taliban were then targeted in not only a land assault but also an aerial bombardment by the Pakistan Air Force (PAF), which ended up targeting the civilian population and business centers in the NWA virtually creating ghost towns. The locals were forced to become IDPs within their own country and some had to seek refuge in Afghanistan. And when these IDPs were to return to their homes, after the operations were declared over and successful, they were forced to sign-up for an additional form of identification called the Watan Card. More distressfully, one their way back, they were forced to go through humiliating interrogation, inspection, abuse and extortion at the check-points set up by thePakistan army. Women and tribal elders were disrespected and insulted at these check-posts. Western observers reported these abuses years ago but the Pakistani media, which is not allowed into the FATA without the army’s permission and also self-censors abundantly, did not report any of it. When some of them protested, they were beaten, tortured and even murdered. After going through the extortion and torture at these crossing points, when the IDPs returned to their homes they found their properties levelled by the aerial bombing, their belongings stolen and even their books burnt. In addition, landmines in the war zone were led to several innocents getting maimed or killed. Why is Pakistan so paranoid about India’s role in Afghanistan? According to the key leader of the PTM, Manzoor Ahmed Pashteen, the Pakistan army has been inflicting collective punishment on families and clans when one of their members is suspected of being a TTP partisan. Several young tribal Pashtun men were killed on the suspicion of being Taliban sympathisers or members and their families were forced to sign declarations that the men died a natural death. Additionally, hundreds if not thousands of Pashtun men have been held in internment camps by the army without any legal recourse. In addition to the thousands of Baloch who have been forcibly disappeared, the Pashtun missing persons epitomise a human rights disaster underway inPakistan. Several others, were killed extra-judicially just like Naqeeb Mehsud, over the suspicion of being the TTP’s members or sympathisers. The PTM’s protests, therefore, are not a bolt from the blue; it is something that has been upwards of 14 years in the making. 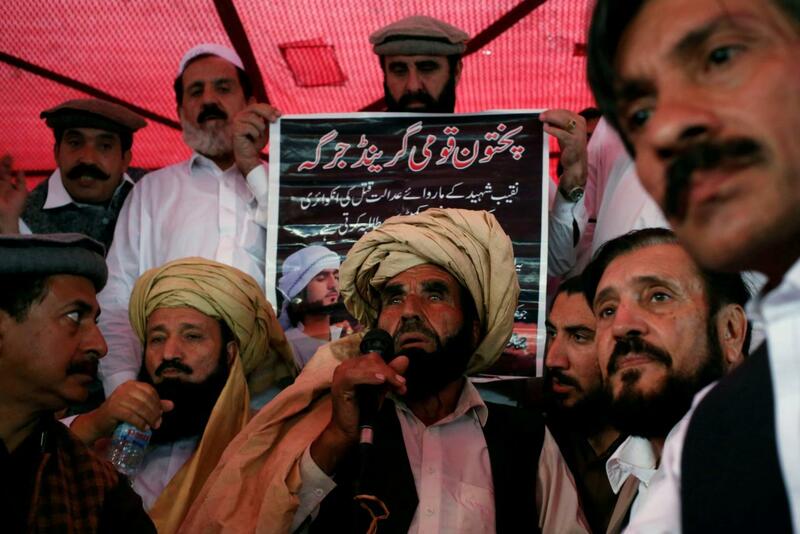 The leaders of this Pashtun protest, including its face Manzoor Ahmed Pashteen, are in their mid-20s. These young men were mere boys when they were forced to become the IDPs first in 2004 and then in 2006, 2007 and finally in 2014 when the Pakistan army conducted its cherry-picked operations against the TTP’s bad Taliban. They spent their formative years in camps or cramped-up rented quarters in the Pakistani cities, observing that while they were becoming cannon fodder in Pakistan’s proxy war against Afghanistan, their peers in the settled areas were enjoying the benefits of city life and pursuing education, career goals and family life in relative comfort. The economic, social, educational and constitutional disparity between the FATA and rest of the Pakistan is a chasm the size of the Grand Canyon. The PTM, however, is essentially apolitical in the sense that it does not seek any political goal as in a part in the government, self-governance or stake irredentist claims, which historically have been the declared or undeclared agenda of the urban Pashtun nationalists. The current mobilisation is essentially a civil and human rights movement that seeks redressal of their grievances within the four corners of the Pakistani constitution. The ten-day-long sit-in in Islamabad had really straightforward demands: a) arrest, prosecute and punish the SSP Rao Anwar; b) clear landmines from FATA; c) stop insulting, humiliating and stereotyping Pashtuns, especially the women, at the FATA check-posts; d) produce or bring to book the missing Pashtuns. The first round of protests in Islamabad did not yield anything concrete. The leaders of the PLM met with the Pakistani Prime Minister Shahid Khaqan Abbasi and the directors of the military’s intelligence and public relation wings. There were reassurances from the state and its functionaries that the demands will be met and even a few dozen missing persons were surreptitiously released. No meaningful initiative, however, has been taken formally to put into practice the PTM’s demands, forcing the latter’s leadership to continue with their protests in the Pashtun territories. The incredibly warm welcome they have received in the Pashtun areas of Balochistan province and the provincial capital Quetta, where they were joined by the ethnic Baloch and Hazaras, has unnerved the army and its intelligence wing. The cellular network service and internet was mysteriously interrupted in cities that PTM has been holding its rallies in, to deny it social media coverage and networking. Mainstream Pakistani media is accustomed to self-censorship and toes the army’s line in a docile manner and has a near-complete blackout over the PLM. The issue, however, is not going to go away by denying it social or conventional media coverage. There are genuine grievances that need to be addressed, and soon. 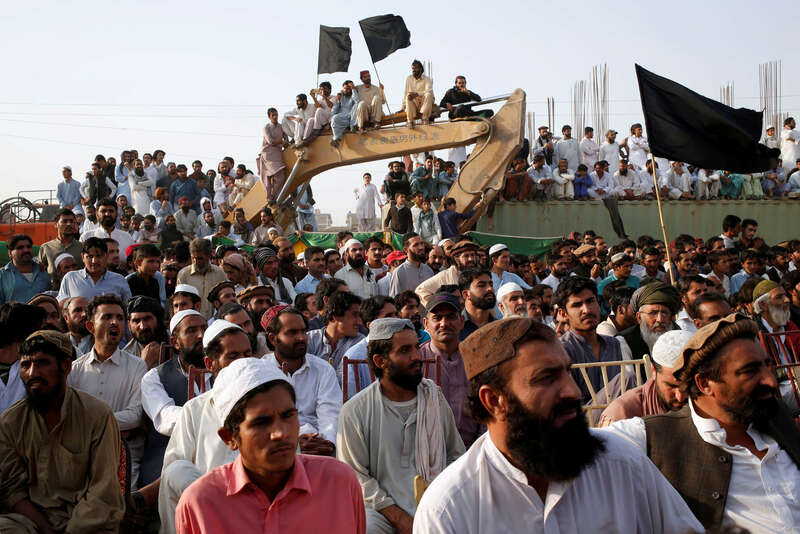 It is unlikely that the Pakistani army will cave in to the Pashtun demands anytime soon. The Pakistan army’s Afghan jihadism project is one of the corner-stones of its regional policies and it is unlikely to abandon it. The organisers of the Pashtun protests have to conceive their response to a recalcitrant continuation of the disastrous policy and calibrate it to remain non-violent, organised and constitutional. Forty years of injustice cannot be undone within days or even months; what is heartening is that the young Pashtun leadership is stepping up to the plate. 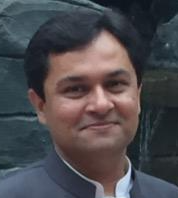 Mohammad Taqi is a Pakistani-American columnist; he tweets at @mazdaki.